over at Happy to Design. 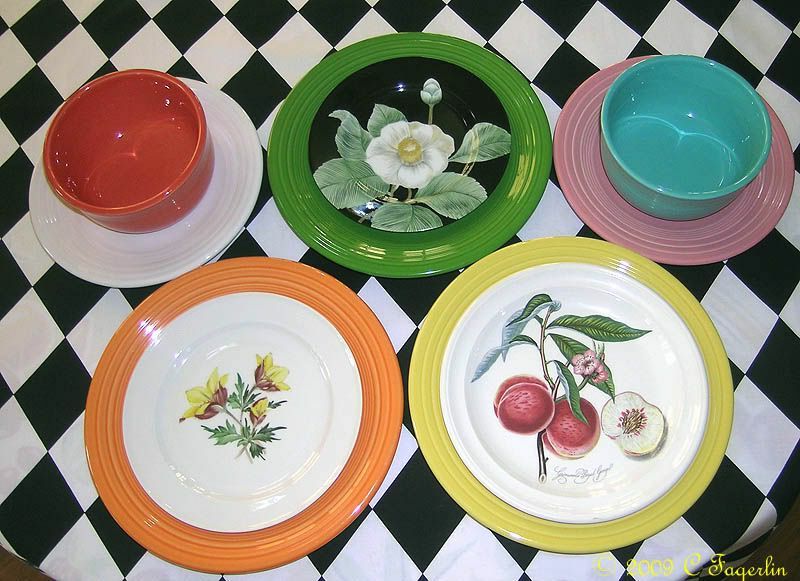 This tablecloth was made from new fabric and can be used with just about any of the many colors found in the Fiesta rainbow. 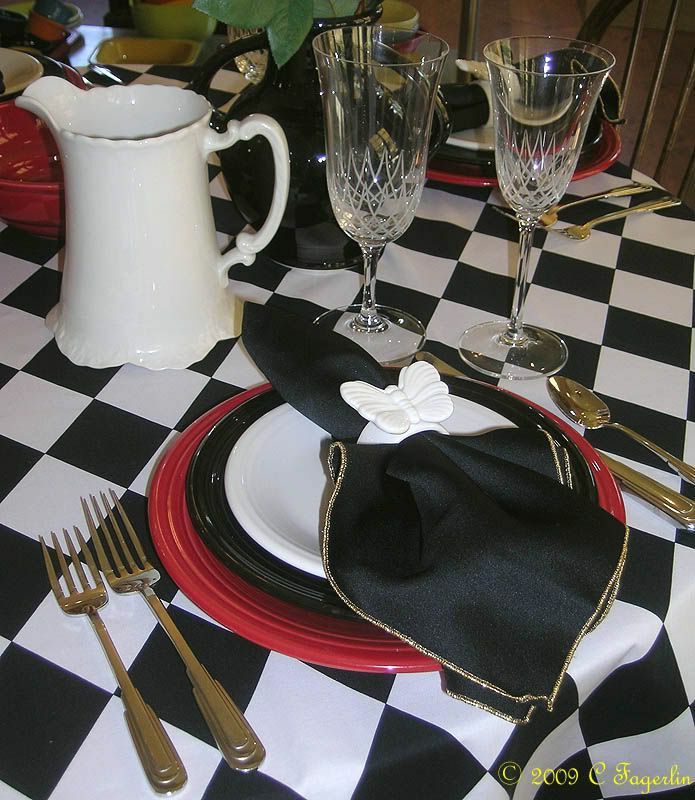 Here it is with Scarlet, Black and White Post 86 Fiesta, Vera Wang "Infinity" crystal, Cityscape flatware. Also shown is Betty Crocker's reissue Scarlet "Betty Bowl", a vintage Huson HLC milk pitcher, and the # 1 Black Millenium Vase from an ELHSAA auction a few years ago. It's Fiesta playing dressup! Very cool. Love those primary colors together. Thanks for sharing this again. You're right it does go with all of them. Love the look. Looks like a 50's soda shop in the 2nd picture. This has a great Valentine feel to it without a heart in sight! Are you serious? Vera Wang designs crystal? Who knew. Well I guess you did but who else? What a pretty table. I love black, white and red together. Ohhh...how very beautiful! Of course, I love anything with a pretty harlequin pattern! 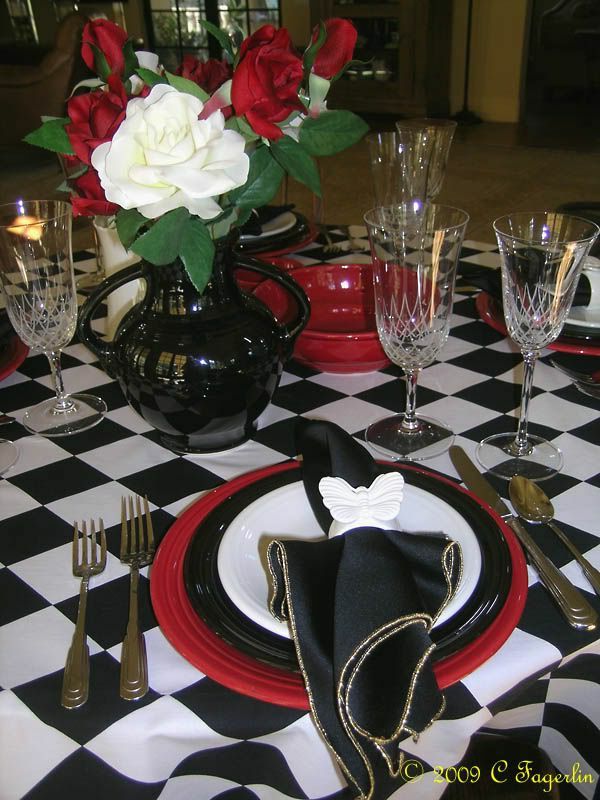 Your color scheme of red, black, and white is just sooo classy and classic!!! 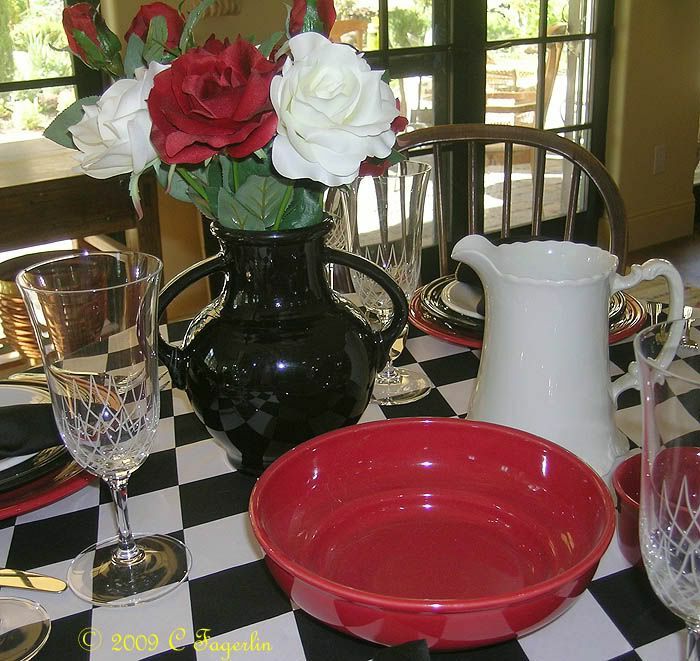 This is one of my favorite tablescapes that you've done...it's gorgeous!!! Wow...what a treasure...love your black fiestaware vase! Oooh...and I also enjoyed seeing all that gorgeous crystal too!!! 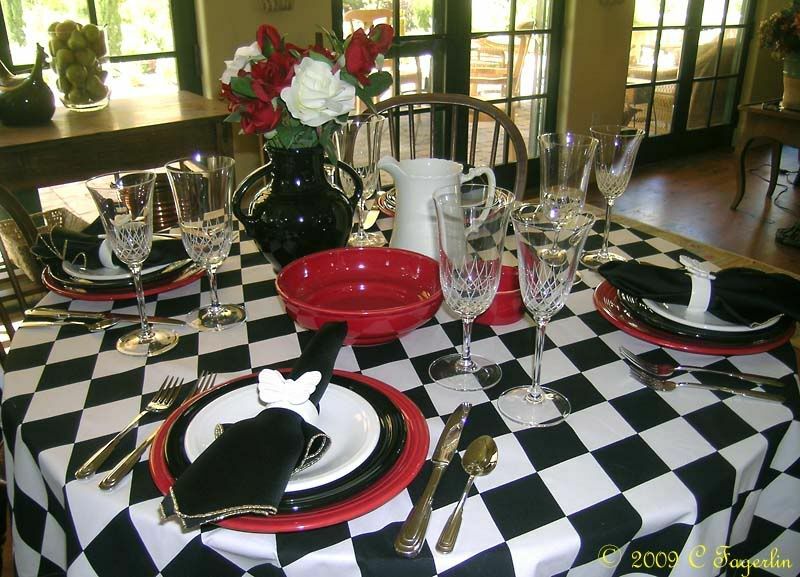 Love, love, LOVE the harlequin patterned tablecloth! This table is the perfect Valentine's Day table, my friend!!! Thank you so much for sharing it with us for Sunday Favorites this week!!! I do apologize at being so late to get by for a visit...but I sure have been enjoying my daughter and all five of my sweet grandbabies surprise visit!!! Have a fabulous week, my friend and thank you again for joining in with the fun of Sunday Favorites!!! Thanks for stopping by to see this re-run everyone. I don't think you can go wrong with black, white and red....ever!